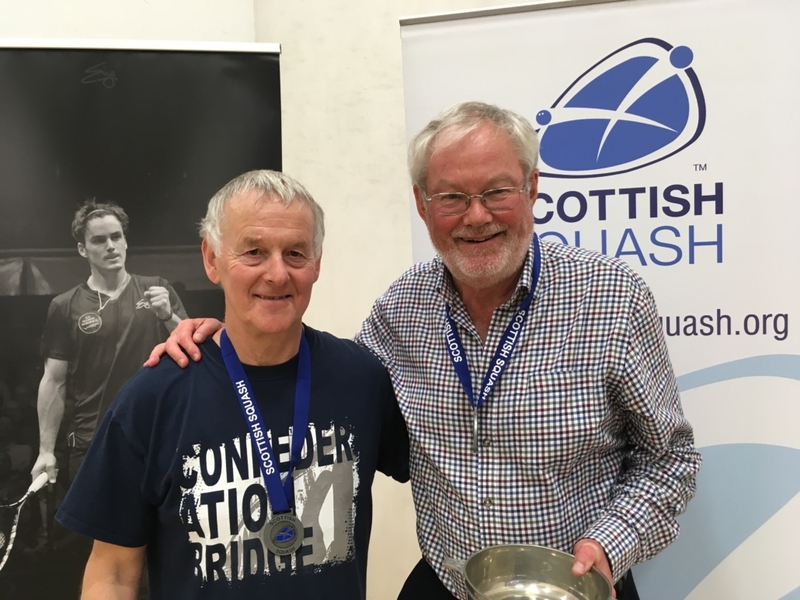 James Wells (2) secured an impressive eighth national title on Sunday (March 17) at the 2019 Scottish National Masters Championships in Inverness. 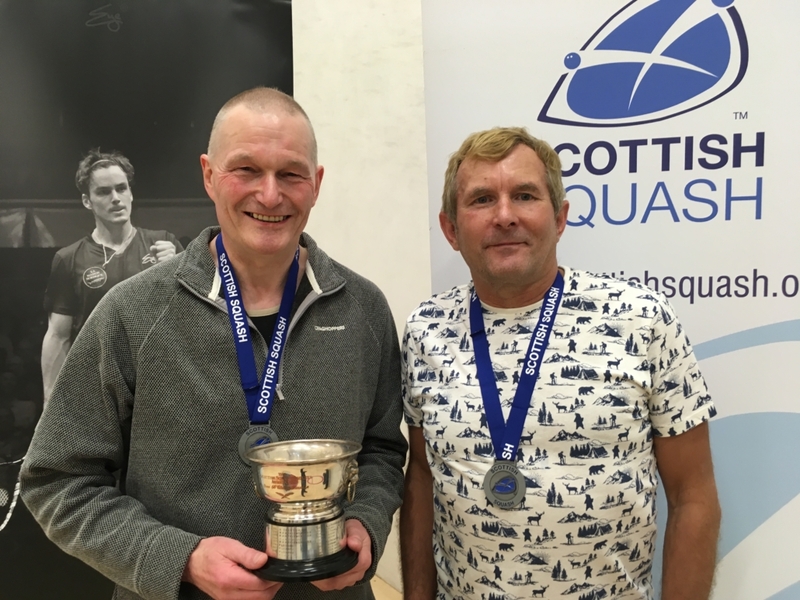 The Dumfries Squash & Racketball Club player beat top seed Chris Holt in a tight Men’s Over 55s final 15-10, 7-15, 12-15, 4-15 at Inverness Tennis and Squash Club. James has now won two titles at every Masters age group he’s entered – 40s, 45s, 50s and 55s. “I was really looking forward to this year and felt in much better shape,” he said after his final. “I’ve trained hard in the past few weeks and was feeling great come Sunday. “Chris started well in the final and was 6-1 up hunting the ball early and pressuring me. “I was getting the ball back but not doing anything with it. “In the second game onwards I slowed things down and got control. “Once I had that control I could move freely into all four corners which helped me. Fifth seed Donald Durrand won the Men’s O55s Plate. 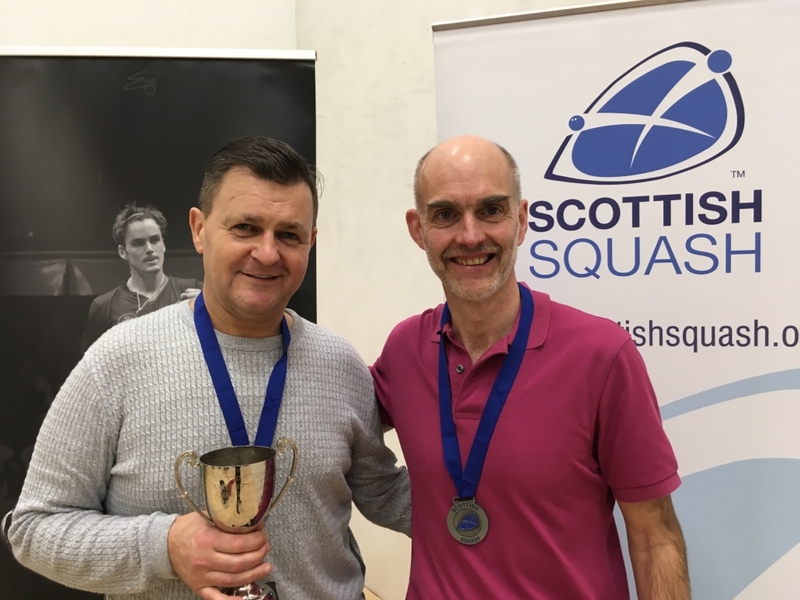 In one of the best matches of this year’s championships, Peter Shivas won his third Scottish Masters title after a gripping 14-16, 15-11, 13-15, 15-9, 10-15 win over defending champion and top seed Robin Ridley in the MO60s final. It was a repeat of last year’s final which Robin won in three games and Peter, seeded two, was thrilled to get over the line this year. Scotland’s longest serving current internationalist, who debuted in 1973, said: “It was a really hard final and I was very pleased to win. “Robin is seeded number one for a reason. “He’s such a tough competitor and a very good player. “I was a bit fortunate with the collision at 6-6 in the fifth when Robin took a blow and that probably affected the outcome. “But I have been working hard on my fitness and stamina and thankfully a couple of small injuries cleared up just in time for this competition. The Townend Squash Club player continued: “It’s always a pleasure to come to Inverness. David McAleese (6) secured victory in the M060s Plate competition. 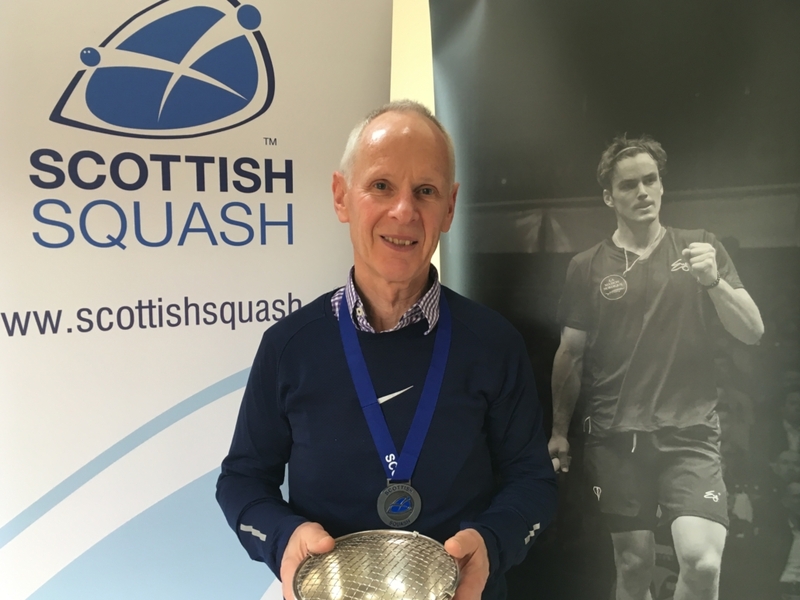 Top seed Jim Dougall took his Scottish National Masters title tally to six on Sunday after victory in the Men’s Over 65s category. The Watsonian beat third seed Ernie Cowell in the final, 15-9, 15-12, 15-10 and didn’t drop a game throughout the weekend. He said: “The field wasn’t as strong as previous years and Ernie had a problem with his hip so I was quite fortunate in the final. “I play three times a week though because the standard in the Masters circuit is generally very strong. He added: “It’ great we have all these Masters events, especially when you retire early like me. Fifth seed Walter McAllister went home with the Men’s O65s Plate. 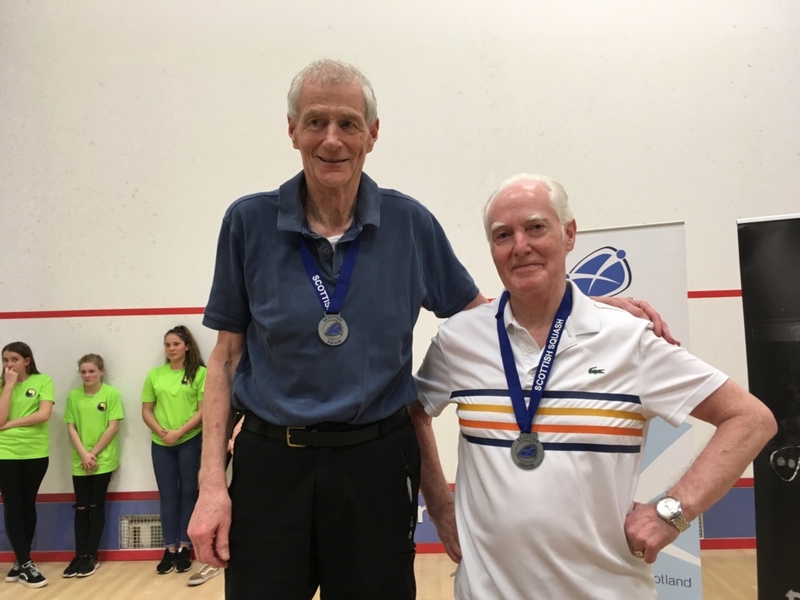 2018 World Masters silver medallist Ian Ross was too strong for the field in the Men’s Over 70s event winning all his matches including the final against Alex Everingham (6) 15-7, 15-12, 15-11. This was Ian’s first time competing in a MO70 event this season as he added the Scottish title to his European O70s title won in 2017. The Grange player said: “I was really keen to play in the Over 70s event with the Home Internationals coming up. “I’m happy to have won and really enjoyed my time in Inverness as ever. Third seed Bernard Starkey won the M070s Plate competition. 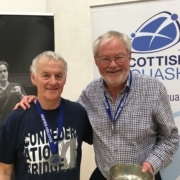 The Over 75s event was played in a round-robin format and won by Ken Reid (2) who sealed his third Scottish National Masters title. Ken, who competes out of Oxford University Squash Club, went unbeaten over the weekend winning all four of his matches. He said: “I beat Tom Kane in my first match and that proved decisive in the end. “Tom was top seed and I was very happy to beat him 3-1 and win my other matches 3-0. “I also played in the MO70s so had six matches altogether which was great. Tom Kane secured silver with David Brown finishing in the bronze medal position. Read the Men’s O35s-50s Masters report here. Read the Women’s report here.